To help you understand the EULA (End User License Agreement), we’ve prepared a bullet-point list that summarizes some of the main ideas (yes, including rights, obligations, liabilities, and all that legalese!) covered in there. IMPORTANT: The following bullet-point list is for convenience purposes only, in order to help you navigate (and hopefully, better understand) the EULA. This bullet-point list is not a substitute for, or even a part of, the EULA, whose terms and conditions constitute a legally binding contract. It is your responsibility to fully read those terms and conditions. You, the customer (or the customer on whose behalf a service provider, such as an agency, is), must be of a legal age in your jurisdiction to form a binding contract, but in any event at least thirteen (13) years old to access or use the Freemius service. Freemius, Inc. is an authorized reseller of “Flight Search Widget Blocks” and is the 'merchant of record' for your purchase. The agreement is between you and Freemius, Inc. on behalf of the Vendor behind “Flight Search Widget Blocks” (the “Vendor”). You may not assign or transfer it without Freemius’ express prior written consent. The agreement contains various clauses to limit and exclude Freemius’ and Vendor’s liability, and it also contains indemnity protection for Freemius. While the EULA is between You and Freemius, Inc., all support and maintenance services for the product (such as providing bug fixes, updates, upgrades, troubleshooting, etc. ), if any, are the sole responsibility of the Vendor. You can contact the Vendor’s support via [email protected]. So if you're having trouble or have any questions, please contact [email protected] for assistance. Freemius, Inc. resells and distributes “Flight Search Widget Blocks” and other plugins and themes "as is" and with no implied or statutory warranties, or guarantees that they will function exactly as you would like, or that they will be compatible with all third-party components and plugins. Support for this product is only available for those who have an active, paid license. Product updates are granted for as long as the your license remains active. Whilst the Vendor attempts to provide the best support possible, there's no guarantee that any particular support query can, or will, be answered to the extent, or within a timeframe, that the inquirer is completely satisfied. Product security and feature updates are included for free as long as your license is active. Updates will be delivered automatically from the WordPress admin dashboard or you can manually download the latest version of the product from your dashboard: https://users.freemius.com/store/1291/login/. The product’s license is sold as automatically recurring subscriptions that renew each month or year (depends on the subscription's billing cycle) on the anniversary of the purchase date. All subscriptions automatically renew at the end of the monthly/annual license term unless You cancel the subscription prior to the automatic renewal date. If a subscription renewal fails, the system will attempt to process the payment 3 more times according to our dunning mechanism schedule. After the 4th failed attempt, the subscription will be canceled. If you subscribe to the monthly or annual plans, and your license expires due to a failed renewal, subscription or license cancellation, the paid features & functionality of the product will be disabled. Prices of “Flight Search Widget Blocks” are subject to change without prior notice or consent. As long as your subscription remains active and you don’t switch to another plan or license-level, your subscription renewals amount will not be affected by any price changes. If you subscribe for a trial with a payment method and cancel the trial before the 1st payment was processed, the paid features & functionality of the product will be disabled. If you subscribe for a trial without a payment method and the trial expires, the paid features & functionality of the product will be disabled. If you subscribe for a trial without a payment method, Freemius will attempt to send you an email reminder 2 days before the trial expiration, giving you the option to purchase a plan. Same like with the trial with a payment method, such a reminder would only be a courtesy, and depends on your email client, potentially can end up at your spam box. If, during the first 7 days following the Purchase date, You experience a defect that makes the Product's material functions unusable, and following Your cooperation with our support team we are unable to resolve it, then following Your request we will issue a full refund of the Purchase price. For clarity, any defect or lack of use arising from a conflict or incompatibility with a third party product, is not covered by this policy, and nor are missing Product features. This End User License Agreement ("Agreement") constitutes a binding contract between you, the customer (or the customer on whose behalf a service provider, such as an agency, is) purchasing the Product (defined below) license ("You" and "Your") and Freemius, Inc. (“Freemius”, “we”, “us” and “our”). If You do not agree with any of the terms and conditions of this Agreement, do not place Your order and do not otherwise access or use the Product. Under this Agreement, You are purchasing a license to the Product ("Purchase"). Under Your Purchase, You receive a license (more on your license rights in Section 2 (License) below). Your Purchase can either be a recurring subscription (e.g. 'monthly' or 'annual') license or a one-time 'lifetime' license (in each case, a "License", and respectively a "Subscription License" and a "Lifetime License"). Freemius is a reseller of the License, and is the 'merchant of record' for the purpose of this transaction. But the vendor from whom You are ultimately receiving access to the Product (the "Vendor") is otherwise responsible for the provision of the Product and all related services, and You acknowledge that Freemius is not the provider or operator of the Product. Again, more on this below. This Agreement contains a range of capitalized terms, some of which are defined in this Section, and some of which are defined elsewhere. The Section headings in this Agreement are for convenience of reading only, so do not rely upon them for interpretation. As used in this Agreement “You” means either you personally or, if you are entering into this Agreement on behalf of an entity (for example, if you are subscribing using an entity’s email domain), such entity, and in such case you represent that you have the authority to bind such entity to this Agreement. "Checkout" means the online checkout form by which You submit(ted) for Your Purchase. Your order is subject to our Acceptance (defined below), and once Accepted the order is hereby incorporated into, and made a part of this Agreement, by reference. “Product” means the software product or service (such as WordPress plugin or theme, or “Serviceware” plugin, or plugins and/or themes bundle) specified in the Checkout. References herein to "Product" shall also include any of its related documentation, as well as any updates and upgrades provided by the Vendor. “Site” means the digital property or service (such as a website, browser extension, mobile app, etc.) owned or operated by You or Your client for which You are using the Product. In the case of a "WordPress multi-site network", each "network sub-site" shall be deemed a Site for the purposes of your order and this Agreement. "Trial" means a limited-in-time use of the Product on a trial basis. "Trial Period" means the period of the Trial, as specified in the Checkout. unless the order is for an Trial, received full payment (as confirmed by us or our payment service provider) of the purchase price of your order through settlement of funds via your provided credit card or other payment method. Notwithstanding the above, if You are purchasing a bundled offering of more than one Product (a "Bundled Offering"), then the Purchase plan terms and refund policy that specifically govern that Bundled Offering as a whole (the "Bundled Offering Terms") shall apply instead of the above-mentioned Vendor Refund Policy and to the extent of any other conflict or inconsistency with a provision of this Agreement. Freemius may (but shall not be obligated to) send You an email reminder of the upcoming payment two (2) or more days prior to the expiration of the Trial Period. You acknowledge that such a reminder would only be a courtesy, and You alone are responsible for taking any action before a payment takes effect. In the case of 'monthly' or 'annual' Paid Trials: if (per the instructions in the reminder email) You fail to cancel the Trial prior to its expiration, the Trial shall convert to a paid Subscription License, and You will be charged the Fees (defined below) for the initial Purchase Term. In the case of a 'lifetime' Paid Trial: You are deemed to have purchased a Lifetime License, and, subject to the Vendor Refund Policy, You will not be charged the Fees until the expiration of the Trial Period. For the purposes of determining Refund eligibility under a Trial, the period stated in the applicable Vendor Refund Policy shall be deemed to begin on the first day of the Trial Period. subject to whatever volume, location, feature, and other limitations or conditions (if any) are specified in the Checkout. We recommend installing and testing the Product in a staging (or similar non-production) environment prior to installing it in the Site's production environment, and making necessary configurations, which should hopefully allow You to identify any code conflicts between the Product and other products or code of the Site, and therefore avoid disruption to Your Site. As a condition to the License, and unless You obtain the prior express written permission of the Vendor, You shall not do (or permit or encourage to be done) any of the following, in whole or in part: (a) copy, “frame” or “mirror” the Product, on any other server or wireless or Internet-based device; (b) sell, assign, transfer, lease, rent, sublicense, distribute, publicly perform, display or communicate, offer as part of a time-sharing, outsourcing or service bureau environment, or otherwise make available, the Product to any third party, or bundle or incorporate the Product into or with any other product or service; (c) modify, alter, adapt, arrange, or translate the Product; (d) decompile, disassemble, decrypt, reverse engineer, extract, or otherwise attempt to discover the source code or non-literal aspects (such as the underlying structure, sequence, organization, file formats, non-public APIs, ideas, or algorithms) of, the Product; (e) remove, alter, or conceal any copyright, trademark, or other proprietary rights notices displayed on or in the Product; (f) circumvent, disable or otherwise interfere with security-related or technical features or protocols of the Product; (g) make a derivative work of the Product, or use the Product to develop any service or product that is the same as (or substantially similar to) the Product; (h) store or transmit any robot, malware, Trojan horse, spyware, or similar malicious item intended (or that has the potential) to damage or disrupt the Product; (i) use the Product to infringe, misappropriate, or violate any third party's Intellectual Property Rights, or any applicable law (such as anti-spamming laws), or to otherwise engage in any fraudulent activity; (j) employ any hardware, software, device, or technique to pool connections or reduce the number of Sites, devices or users that directly access or use the Product (sometimes referred to as 'virtualisation', 'multiplexing' or 'pooling') in order to circumvent any restrictions on scope of the License; or (k) take any action that imposes or may impose (as determined in Freemius' reasonable discretion) an unreasonable or disproportionately large load on the servers, network, bandwidth, or other cloud infrastructure which operate or support the Product, or otherwise systematically abuse or disrupt the integrity of such servers, network, bandwidth, or infrastructure. The Product may include third party software components, as well as proprietary components (such as Freemius' SDK component that is applied to the Product), that are subject to open source licenses and/or notices (“Third Party Software” and “Third Party Software Terms”, respectively). This Agreement is not intended, and shall not be construed, to derogate from any rights You may have under such Third Party Software Terms. Accordingly, to the extent that the Product (or any part thereof) is subject to any Third Party Software Terms or to any other licensing terms, and they conflict with the scope of the License granted to You or with any provision of this Agreement, such Third Party Software Terms or other licensing terms (as the case may be) shall prevail. Any undertakings, representations, warranties, guarantees, conditions, or other commitments made by Freemius in this Agreement concerning the Product (if any), are made by Freemius and not by any authors, licensors, or suppliers of, or contributors to, such Third Party Software. As an example only: if the Product is subject to the GNU General Public License (GPL), then You may use the Product in accordance with the GPL, and may ignore any provision of this Agreement (such as a conflicting License restriction above or a conflicting ownership provision) which conflicts with the GPL. Fees. If or once You have purchased a paid License (including, for example, if You failed to cancel a Paid Trial before its expiry), You agree to pay all fees stated in the Checkout ("Fees"), and in accordance with its payment terms. Following receipt of Your order, You authorize Freemius (either directly and/or through third parties) to request and collect payment (or otherwise charge, refund or take any other billing actions) from our payment provider or Your designated banking account, and to charge Your payment method, as well make any inquiries Freemius deems necessary to validate Your designated payment account or financial information, in order to ensure prompt payment (including for the purpose of receiving updated payment details from Your payment, credit card or banking account provider – such as, updated expiry date as may be provided to us by Your credit card company). In connection with Purchase renewals (if applicable), Freemius will attempt to automatically charge You the applicable renewal Fees. In the event of failure to collect the Fees owed by You, we may (but shall not be obligated to) retry to collect at a later time, and/or suspend or terminate Your Purchase, without further notice. Where the Fees are invoiced, each invoice shall be due and payable in full by the due date specified on the invoice. Freemius shall not be responsible or liable (such as for bank fees) in the event any charge causes a negative balance in Your bank or payment account. Refunds. You acknowledge and agree that any refunds, cancellations, and returns (collectively, "Refunds") for the Product are subject to the Vendor Refund Policy, and that, even though Freemius may assist or otherwise be involved in administering Refunds eligibility for Refunds is determined by Vendor (and not Freemius). However, Freemius may (but shall not be obligated to) determine Refund eligibility in certain cases, such as if there has been as duplicate charge to Your payment method. Price Changes; Renewal Discounts. In respect of Subscription Licenses only: Provided that Your recurring subscription is active, has not changed, and has not been terminated or cancelled: (a) any changes (increases or decreases) to the Product pricing during the Purchase Term shall not affect Your Purchase plan; and (b) You will be entitled to any renewal discounts offered by the Vendor. Changing Plans. When You change Your Purchase plan, You will be deemed to have made a new Purchase, and accordingly no renewal discount will be applicable for such change. You may, however, be entitled to pro-rated Fees for the new Purchase (as further described here: https://freemius.com/help/documentation/selling-with-freemius/proration/). are non-refundable (subject to the Vendor Refund Policy), and are without any right of set-off or cancellation. All support and maintenance services for the Product (such as providing bug fixes, updates, upgrades, troubleshooting, etc. ), if any, are the sole responsibility of the Vendor, and You agree: (a) to look to the Vendor alone for such support and maintenance; and (b) that Freemius has no obligation to provide any such (or similar) services under this Agreement. Nor does Freemius offer or give any Product warranty (see Section ‎8 (Disclaimer of Warranties) for more information). Any Product support and maintenance services that are provided by the Vendor will (unless the Vendor agrees in writing with You otherwise) only be provided to You (or Your service provider, if applicable) and with respect to the applicable Site(s). Some updates and upgrades may be implemented by the Vendor automatically, and some may be implemented manually; but in either case, updates and upgrades to the Product will override any prior modifications You made to the Product. Moreover, You will not be eligible for support and maintenance services in the event You modify the Product, nor following termination or cancellation of Your Purchase. The only support Freemius shall be obligated to provide under this Agreement is first-tier aftersales support (which includes billing and order-related support), which will be provided to You only. As with support and maintenance services, features of the Product are also the sole responsibility of the Vendor. This includes, but is not limited to, issues as to feature availability, operability, blocking, and de-activation. A new or modified feature may be accompanied by separate or additional terms and conditions. You agree: (a) to look to the Vendor alone for issues relating to features; and (b) that Freemius has no obligation to address issues relating to features. Moreover, and in respect of Licenses that are configured by the Vendor as 'blocking' Licenses: following termination or cancellation of Your Purchase or Your Paid Trial, or expiration of Your free Trial without a payment method, some or all of the Product's 'paid' features may be disabled by the Vendor (and in the event Your Purchase plan is 'monthly', and depending on Your billing cycle, such 'paid' features are automatically disabled), and You acknowledge that this may have the effect of disabling or rendering unusable the entire Product itself. Product. Freemius and its licensors exclusively own all Intellectual Property Rights (defined below) in and to the Product. Furthermore, Freemius and/or its licensors shall exclusively own (and are hereby assigned) all Intellectual Property Rights in and to any derivative works and/or improvements in or to the Product (regardless of inventorship or authorship); unless the Product is governed by Third Party Software Terms that permit You to make derivative works and/or improvements to the Product, in which case, as between You, Freemius and Vendor, You will exclusively own the Intellectual Property Rights in and to such derivative works and improvements. Except for the License, You are granted no other right or license in or to the Product, whether by implied license, estoppel, patent exhaustion, operation of law, or otherwise. Any rights not expressly granted herein are hereby reserved by Freemius and its licensors. Feedback. If You provide Freemius with any ideas, suggestions, or similar feedback about performance of the Product or for improving the Product (“Feedback”), You hereby grant to each of Freemius and all Freemius Affiliates a worldwide, assignable, non-exclusive, royalty-free, fully paid-up, sublicensable (through multiple tiers of sublicensees), irrevocable, and perpetual license, to access, use, reproduce, distribute, publish, broadcast, make available to the public, modify, adapt, edit, create derivative works of, publicly display, publically perform, and otherwise commercially exploit such Feedback, in any media format and through any media channels (now known or hereafter developed) (“Feedback License”). You hereby represent and warrant that: (A) the Feedback does not, and will not, infringe, misappropriate or violate any third party's Intellectual Property Rights, or any law; and (B) You have obtained, and will maintain during and after this Agreement, all licenses, permissions, consents, approvals, and authorizations required to grant the Feedback License. The Feedback License shall survive any termination of this Agreement. Definition of IP Rights. “Intellectual Property Rights” means any and all rights, titles, and interests in and to inventions, works of authorship, databases, technology, designs, and other intellectual property, and includes without limitation patents, copyright and similar authorship rights, personal rights (such as moral rights, rights of privacy, and publicity rights), architectural, building and location (and similar geography-based) rights, mask work rights, trade secret and similar confidentiality rights, design rights, database rights, industrial property rights, trademark, trade name, trade dress and similar branding rights, as well as: (a) all applications, registrations, renewals, extensions, continuations, continuations-in-part, divisions or reissues of the foregoing rights; and (b) all goodwill associated with the foregoing rights. Purchase Term and Renewals. This Agreement commences on the Effective Date and shall, unless terminated in accordance herewith, continue in full force and effect for the duration of the Purchase Term. If the Purchase Term is 'monthly' or 'annual', it shall automatically renew for successive periods of equal length, unless you cancel the Purchase by canceling the subscription prior to such renewal in accordance with the below. If the Purchase Term is 'annual' (including multi-annual), Freemius may (but shall not be obligated to) provide You with a reminder of the upcoming renewal. You acknowledge that such a reminder would only be a courtesy, and You alone are responsible for taking any action before a renewal takes effect. Cancellation by You. You may cancel Your Purchase at any time and for any reason, via the functionality offered. If You cancel the Purchase, the cancellation will take effect immediately (and will automatically stop any renewals) and the corresponding License will terminate at the end of the then-current Purchase Term. If the Purchase Term is 'lifetime', the Purchase is not eligible for cancellation by You. If You cancel a Trial, the Product's 'paid' features will be automatically disabled, unless the Product is designated as 'premium-only', in which case the entire Product will be disabled. If You object to any provision of this Agreement or any subsequent changes thereto, or becomes dissatisfied with the Product in any way, Your only recourse against Freemius is to cancel Your Trial or Purchase (as applicable) as aforementioned. Termination by Freemius. Freemius may, at any time, terminate Your Purchase (regardless of the Purchase Term) for convenience, by written notice to You (including via the functionality offered). In such cases, Freemius shall give You a pro-rated refund of any prepaid Fees, as follows: (a) in the case of a 'lifetime' Purchase Term, depreciated on a three (3) year straight line basis from the date of installation of the Product; and (b) in the case of non-'lifetime' Purchase Terms (such as 'monthly' or 'annual'), based on the remaining then-current Purchase Term. Effect of Purchase Termination. Upon termination or cancellation of Your Purchase: (a) the License automatically terminates, and You must immediately cease all access to and use of the Product except to the extent any features of the Product remain available to You; (b) You shall promptly pay any unpaid amounts that are outstanding as of such termination or cancellation. Termination and cancellation shall not affect any rights and obligations accrued as of the effective date thereof. Survival. Any provision that is stated to survive, or that ought by its nature to survive, shall survive termination of this Agreement. The following shall also survive termination of this Agreement: Sections ‎7 (Ownership) through‎ 14 (Miscellaneous) inclusive. THE PRODUCT, AS WELL AS ANY OTHER ITEMS OR SERVICES PROVIDED BY FREEMIUS, ARE PROVIDED AND MADE AVAILABLE TO YOU ON AN “AS IS” AND “AS AVAILABLE” BASIS, WITH ALL FAULTS, AND WITHOUT ANY REPRESENTATION, WARRANTY, GUARANTEE OR CONDITION OF ANY KIND WHATSOEVER, WHETHER EXPRESS, IMPLIED OR STATUTORY, INCLUDING WITHOUT LIMITATION ANY IMPLIED WARRANTIES OF MERCHANTABILITY, FITNESS FOR A PARTICULAR PURPOSE, SATISFACTORY QUALITY, QUIET POSSESSION, TITLE, QUALITY OF SERVICE, NON-INFRINGEMENT, OR THAT OTHERWISE ARISE FROM A COURSE OF PERFORMANCE OR DEALING, OR USAGE OF TRADE, ALL OF WHICH ARE HEREBY DISCLAIMED BY FREEMIUS. IN ADDITION, FREEMIUS DOES NOT MAKE ANY REPRESENTATION, WARRANTY, GUARANTEE OR CONDITION: (A) REGARDING THE EFFECTIVENESS, USEFULNESS, RELIABILITY, AVAILABILITY, TIMELINESS, ACCURACY, OR COMPLETENESS OF THE PRODUCT; (B) THAT YOUR USE OF, OR RELIANCE UPON, THE PRODUCT WILL MEET ANY REQUIREMENTS OR EXPECTATIONS; (C) THAT THE PRODUCT WILL BE UNINTERRUPTED, SECURE, ERROR-FREE OR VIRUS-FREE, OR THAT DEFECTS WILL BE CORRECTED; OR (D) REGARDING THE SATISFACTION OF, OR COMPLIANCE WITH, ANY GOVERNMENT REGULATIONS OR STANDARDS. THE COMBINED AGGREGATE LIABILITY OF FREEMIUS AND ALL FREEMIUS AFFILIATES UNDER, OR OTHERWISE IN CONNECTION WITH, THIS AGREEMENT SHALL NOT EXCEED THE AMOUNTS ACTUALLY PAID BY YOU TO FREEMIUS UNDER THIS AGREEMENT FOR THE APPLICABLE PRODUCT THAT GAVE RISE TO LIABILITY. (each of the foregoing, an “Indemnity Claim”) then, upon written request by Freemius (to be decided in our sole discretion), You agree to assume full control of the defense and settlement of the Indemnity Claim; provided, however, that (c) Freemius reserves the right, at any time thereafter, to take over full or partial control of the defense and/or settlement of the Indemnity Claim, and in such cases You agree to reasonably cooperate with Freemius' defense activities at Your own cost and expense; and (d) You shall not settle any Indemnity Claim, or admit to any liability thereunder, without the express prior written consent of the Indemnitee(s). In addition, and regardless of whether (or the extent to which) You controlled or participated in the defense and/or settlement of an Indemnity Claim, You agree to indemnify and hold harmless the Indemnitee(s) for and against: (e) any costs and expenses (including reasonable attorneys' fees) incurred by the Indemnitee(s) in the defense of the Indemnity Claim; and (f) any amounts awarded against, or imposed upon, the Indemnitee(s) under such Indemnity Claim, or otherwise paid in settlement of the Indemnity Claim (including without limitation any fines or penalties). Mandatory, Bilateral Arbitration. YOU AND FREEMIUS AGREE THAT ANY DISPUTE, CONTROVERSY OR CLAIM ARISING UNDER, OR OTHERWISE IN CONNECTION WITH, THIS AGREEMENT (EACH, A “Dispute”) SHALL BE RESOLVED ONLY BY FINAL AND BINDING BILATERAL ARBITRATION, except that each party retains the right to bring an individual action in a small claims court and the right to seek injunctive or other equitable relief in a court of competent jurisdiction to prevent the actual or threatened infringement, misappropriation or violation of a party’s Intellectual Property Rights. This agreement to arbitrate is intended to be broadly interpreted. Notwithstanding Your and Freemius’ agreement that New York law governs this Agreement and its validity, interpretation and application, You and Freemius hereby further agree that the Federal Arbitration Act, 9 U.S.C. § 1, et seq. (“FAA”) applies to this agreement to arbitrate, and governs all questions of whether a Dispute is subject to arbitration. Unless You and Freemius expressly agree otherwise in writing in respect of a Dispute, the arbitration shall be administered by Judicial Arbitration and Mediation Services, Inc. (“JAMS”), pursuant to JAMS Streamlined Arbitration Rules and Procedures (“JAMS Streamlined Rules”), as modified by this Agreement (that is, the terms of this Section ‎17 govern if they conflict with any of the JAMS Streamlined Rules), and consistent with the JAMS Policy on Consumer Arbitrations Pursuant to Pre-Dispute Clauses Minimum Standards of Procedural Fairness (“JAMS Consumer Fairness Standards”). The arbitrator must honor the terms and conditions of this Agreement (including without limitation all liability exclusions and limitations), and can award damages and relief, including any attorneys’ fees authorized by law. YOU AGREE THAT, BY ENTERING INTO THIS AGREEMENT, YOU AND FREEMIUS ARE HEREBY EACH IRREVOCABLY WAIVING THE RIGHT TO A TRIAL BY JURY AND THE RIGHT TO PARTICIPATE IN A CLASS ACTION (OR OTHER CLASS-WIDE PROCEEDING). Notwithstanding JAMS Streamlined Rule 8(b), You and Freemius agree that any dispute as to the arbitrability of a Dispute brought by either You or Freemius shall be resolved by a court of competent jurisdiction. THIS ARBITRATION AGREEMENT DOES NOT ALLOW CLASS ARBITRATIONS EVEN IF THE JAMS STREAMLINED RULES, (OR OTHER PROCEDURES OR RULES OF JAMS) WOULD. RATHER, YOU AND FREEMIUS ARE ONLY ENTITLED TO PURSUE ARBITRATION ON AN INDIVIDUAL BASIS. FURTHER, AND UNLESS YOU AND FREEMIUS EXPRESSLY AGREE OTHERWISE IN WRITING IN RESPECT OF A DISPUTE, THE ARBITRATOR MAY NOT CONSOLIDATE MORE THAN ONE INDIVIDUAL PARTY’S DISPUTE WITH ANY OTHER PARTY’S DISPUTE(S), AND MAY NOT OTHERWISE PRESIDE OVER ANY FORM OF A REPRESENTATIVE OR COLLECTIVE PROCEEDING. The arbitrator will be subject to this Agreement, and shall not make any decision or award that is in excess of, or contrary to, what this Agreement provides. The arbitrator will render an award in accordance with JAMS Streamlined Rules. The arbitrator’s decision will include the essential findings and conclusions upon which the arbitrator based the award. Judgment on the arbitration award may be entered in any court having jurisdiction thereof. In the event any litigation should arise between You and Freemius in any court of competent jurisdiction in a proceeding to vacate or enforce an arbitration award, YOU AND FREEMIUS HEREBY IRREVOCABLY WAIVE ALL RIGHTS TO A JURY TRIAL, instead electing that the proceeding be resolved by a judge. The arbitrator may award declaratory or injunctive relief only in favor of the plaintiff/claimant and only to the extent necessary to provide relief warranted by the claimant’s individual claim. If You prevail in arbitration You will be entitled to an award of attorneys' fees and expenses, to the extent provided under applicable Law. Freemius will not seek, and hereby waives all rights Freemius may have under applicable Law, to recover attorneys’ fees and expenses if Freemius prevails in arbitration, unless You assert a frivolous claim. Unless You and Freemius expressly agree otherwise in writing, the arbitration will take place in-person at the following locations: (a) if You are a resident of a country in North America, Central America or South America, the arbitration will take place in New York City, New York, USA; or (b) if You are a resident of any other country in the world, the arbitration will take place in Tel Aviv-Jaffa, Israel. In the event JAMS indicates that it is unable to provide, or arrange for, an arbitrator in Israel, You agree that the arbitration will be held in New York City, New York, USA. If You initiate an arbitration for a Dispute, You will be required to pay $250 of the fee required to initiate the arbitration and Freemius will pay any remaining JAMS Case Management Fees and all professional fees for the arbitrator’s services; You will remain responsible for its respective costs relating to counsel, experts, witnesses, and travel to the arbitration. If Freemius initiates an arbitration for a Dispute, Freemius will pay all administrative fees and costs related to the arbitration, including all professional fees for the arbitrator’s services; You will remain responsible for its costs relating to counsel, experts, witnesses, and travel to the arbitration. Notwithstanding the foregoing, either party may bring an individual action in a small claims court for Disputes within the scope of such court’s jurisdiction. This agreement to arbitrate does not preclude You from bringing issues to the attention of federal, state, or local agencies. Such agencies can, if the Law allows, seek relief against Freemius on Your behalf. Opting Out of this Mandatory Arbitration. You can decline this agreement to arbitrate by contacting [email protected] within thirty (30) days of the Effective Date and stating that You decline this arbitration agreement. Furthermore, and notwithstanding the provisions regarding modification of the Agreement, if Freemius changes this Dispute Resolution Section after the Effective Date (or the date You accepted any subsequent changes to this Agreement), You may reject any such change by providing Freemius written notice of such rejection to [email protected] within thirty (30) days of the date such change became effective, as per the terms of this Agreement. In order to be effective, the notice must include Your full name and clearly indicate its intent to reject the change(s) to this Dispute Resolution Section. By rejecting such change(s), You are agreeing that it will arbitrate any Dispute between You and Freemius in accordance with the provisions of this Dispute Resolution Section as of the Effective Date (or the date You accepted any subsequent changes to this Agreement), unless You declined this arbitration agreement in the manner described above. Limitation on Claims. Regardless of any law to the contrary, any claim or cause of action arising out of, or related to, this Agreement must be filed within one (1) year after such claim or cause of action arose, or else You agree that such claim or cause of action will be barred forever. Entire Agreement. This Agreement represents the entire agreement between You and Freemius with respect to the subject matter hereof, and supersedes and replaces any and all prior and contemporaneous oral and/or written agreements, understandings and statements between You and Freemius with respect to such subject matter. You acknowledge and agree that in entering into this Agreement You have not relied on any statement or representation (whether negligently or innocently made) not expressly set out in this Agreement, such as statements and explanations in any FAQs, summaries or explanatory guides regarding this Agreement, or other marketing material on the Freemius or Vendor websites. To the extent of any conflict or inconsistency between these terms and conditions on the one hand, and the Checkout on the other hand, the former shall prevail. The language of this Agreement is expressly agreed to be the English language. By entering into the Agreement, You hereby irrevocably waive, to the maximum extent legally permitted, any law applicable to You requiring that the Agreement be localized to meet Your language (as well as any other localization requirements), or requiring an original (non-electronic) signature or delivery or retention of non-electronic records. We may be able (but are not obligated) to provide You with copies of this Agreement on written request; however, please be sure to print a copy of this Agreement for Your own records. Assignment. Freemius may assign this Agreement (or any of its rights and/or obligations hereunder) without Your consent, and without notice or obligation to You. This Agreement is personal to You, and, except as permitted by this Agreement, You may not assign (or in any other way transfer) this Agreement (or any of its obligations or rights hereunder) without Freemius' express prior written consent. Any prohibited assignment shall be null and void. Waiver. No failure or delay on the part of any party in exercising any right or remedy under this Agreement shall operate as a waiver thereof, nor shall any single or partial exercise of any such right or remedy preclude any other or further exercise thereof or the exercise of any other right or remedy. Any waiver granted hereunder must be in writing (for waivers by You, emails will be acceptable; for waivers by Freemius, the writing must be duly signed by an authorized representative of Freemius), and shall be valid only in the specific instance in which given. Notices. 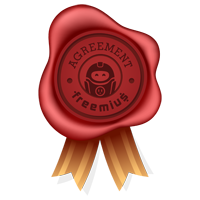 You agree that Freemius may send You notices by email and/or by regular mail. Except as stated otherwise in this Agreement or required by law applicable to You, You agree to send all notices to Freemius, to [email protected]. No Third Party Beneficiaries. Except as otherwise expressly provided in this Agreement (such as Freemius Affiliates, Freemius' licensors and suppliers, and Indemnitees), there shall be no third-party beneficiaries of or under this Agreement. U.S. Government Rights. The Product is “commercial computer software” and the documentation is “commercial computer software documentation”, pursuant to DFAR Section 227.7202 and FAR Section 12.212, as applicable. If You are an agency, department, employee or other entity of the United States Government, then Your access to and use of the Product shall be subject solely to the terms and conditions of this Agreement. Export Compliance. You represent and warrant that: (a) You are not a resident of (and You will not use the Product in) a country that the U.S. government has embargoed for use of the Product, nor are You named on the U.S. Treasury Department’s list of Specially Designated Nationals or any other applicable trade sanctioning regulations of any jurisdiction; and (b) Your country of residence and/or incorporation (as applicable) is the same as the country specified in the contact and/or billing address provided to us. In the event You breach this Section (in whole or in part), or otherwise violate any Export Control Laws (defined below) in connection with the Product, You agrees to indemnify and hold harmless Freemius, all Freemius Affiliates, and the Vendor (including ours and their respective directors, officers, and employees) for any fines and/or penalties imposed upon Freemius, a Freemius Affiliate, and/or Vendor (or such individuals) as a result of such breach or violation. “Export Control Laws” means all applicable export and re-export control Laws applicable to You and/or Freemius, as well as the United States' Export Administration Regulations (EAR) maintained by the US Department of Commerce, trade and economic sanctions maintained by the US Treasury Department's Office of Foreign Assets Control, and the International Traffic in Arms Regulations (ITAR) maintained by the US Department of State. Force Majeure. Freemius shall not be responsible for any failure to perform any obligation or provide any service hereunder because of any (a) act of God, (b) war, riot or civil commotion, (c) governmental acts or directives, strikes, work stoppage, or equipment or facilities shortages, and/or (d) other similar cause beyond Freemius' reasonable control. For the avoidance of doubt, any problems relating to the hosting of the Service shall not be deemed within Freemius' reasonable control.